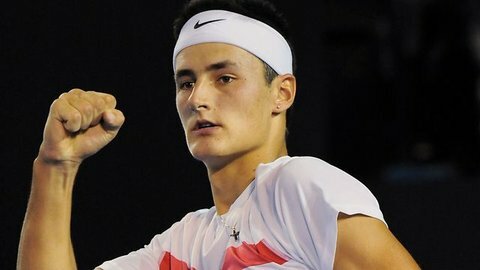 Bernard Tomic carries Australia over the Czech Republic. The Scotsman was thrilled to be at home taking down Donald Young and John Isner and led Great Britain over the USA in the Davis Cup. Essentially, he sounds like one of the coaches, and he loves putting together his X’s and O’s. Without question, some day he will retire and he will be the captain. But can the GB actually win the title one day? Hmmm. The Aussie won two matches over the Czech and they have advanced to meet Kazakhstan. For the past couple of years, Tomic disappeared for months on end. This year, he is really trying every week. If he doesn’t get hurt, he will reach the top 10 after Wimbledon, or darn close. Yes, the Canadian Pospisil lost to Kei Nishikori on the first day against Japan, but he and Nestor won the doubles in five sets and at 2-2 on Sunday, he came through, winning in three sets to grab the title. He has had a tough year, but now maybe he can turn it around. Who do you like, the captain Arnaud Clement, or Giles Simons, Gael Monfils, Julian Benneteau or Nicolas Mahut? They all won over Germany and they all looked were strategic and thoughtful. They appear to like each other off the court, as well as Jo-Wilfred Tsonga and Richard Gasquet, who are hurt. They are a true team and should be able to win it all this year – if they maintain their focus in each round. Novak Djokovic says that his team can win the title again and perhaps they will, IF the world No. 1 is healthy this season. He actually won the singles and doubles this week, when they romped over Croatia. If Novak plays the dubs again and is willing to play three matches in three days, he could eventually meet Andy Murray in the Davis Cup. That would be a treat. Credit must go to Mikhail Kukushkin by winning two matches at home against Italians Simone Bolelli and Andreas Seppi. And then totally out of nowhere on the decider at 2-2, the No. 130 Aleksandr Nedovyesov over Fabio Fognini 7-5 in the fifth set to grab it 3-2. Few knew who he was, now Nedovyesov is here to stay. Yes, the Swiss lost to Belgium 3-2,, with David Goffin winning the deciding match. But the Swiss No. 130 Henri Laaksonen won two singles matches. Had either Stan Wawrinka or Roger Federer played, they likely would have won the Davis Cup. Props must be given to the captain, Severin Luthi. Even though she did not play any of the top 20 players, Caro really needed a title and she got it, beating Alexandra Dulgheru in Malaysian for the crown. Wozniacki now has 23 WTA titles, which is fine, but she hasn’t won a Premier Event since 2012. Indian Wells is waiting for you. The American lost both matches against the Great Britain, falling to James Ward and Andy Murray. After taking the first two sets over Ward, he lost six straight in the two matches. Isner is very upset, saying that he threw it all away. Obviously, he has had a difficult season this year. Can he turn it around soon? Perhaps, but he absolutely has to change his returns. The Italians looked very good with Simone Bolelli, Fognini and Seppi at the Davis Cup. They all looked very flashy during the first two months entering against Kazakhstan, but on Sunday, Seppi and Fognini imploded and fell 3-2. Back to there drawing board. Without question, Carolina Garcia is rising and she bouced the defending champion Ana Ivanovic. InMonterrey, Ana was there for the taking. The world No. 6 Ivanovic wants to win a Slam again, but first of all, she has to be much more consistent. The young Borna Coric played fairly well in losing to Viktor Troicki,, but Djokovic crushed the other two who aren’t ready for prime time. Croatia’s top man, Marin Cilic, has to come back very soon. And why isn’t Ivo Karlovic playing at all? The Davis Cup sure could use them.